As stocks work off a knee jerk reaction to the worst December sell off since 1932, traders are wondering what matters most to the market right now. Several times in the past month, market weakness has been lifted by the fake news of a trade deal with China. That unconfirmed rumor has propelled stocks higher today as well. From my perspective as an investment advisor representative, the one thing that has impacted markets most dramatically since the beginning of the 21st century – and continues to weigh on it today – is the practice of market intervention by the world’s central banks through the manipulation of interest rates. Since the market peak in 2000 a tsunami of Baby Boomers have shifted into retirement, thrusting themselves on the mercy of low savings, an anemic Social Security system, and woefully underfunded pensions. Another 50% decline in stocks (we’ve already seen two since 2000) could threaten the health of our economic foundation. During the dot.com hysteria the Fed funds rate (the rate at which the Federal Reserve lends to its member banks) stood at a robust 6.5% in July, 2000. Can you imagine that? It seems like a different lifetime. At the stock market peak just prior to the financial crisis of 2007 the rate was 5.25%. When the stock bubble burst in 2000 the Fed lowered its lending rate from 6.5% to 1% in July 2003 and kept it there for one year before eventually raising rates back up to 5.25%. When the financial crisis hit in the summer of 2007 the Fed cut rates all the way to zero and kept them there for seven years before raising them up to the current level of 2.25%. I contend that the Fed, through its easy money policies, has effectively established a new financial culture that will be extremely difficult to remove ourselves from. During the seven years of Fed life-support US corporate and government debt exploded. US public debt increased 76% from $10.7 trillion to $18.9 trillion. National gross domestic product increased a relatively anemic 26% during that same time period. With the entire country debt-addicted by way of “intravenously” administered low interest rates, what is the plan to dry us out? Or is there one? Lower interest rates inspired wild spending on the part of corporate America as well. This abuse is no more obvious than among the smallest and most economically sensitive companies. 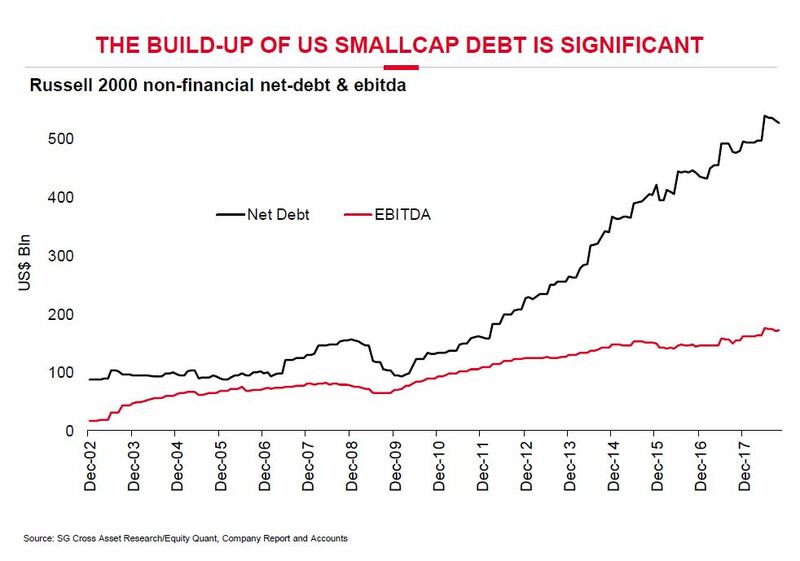 Since the advent of zero percent interest rates, debt (black line, below) among the market’s smallest companies has exploded (see chart below) while the earnings (red line, below) they produce (and service the debt with) has increased only marginally in comparison. The next market decline could be especially harsh on small cap stocks with poor balance sheets and limited access to capital. Many large corporations have been just as irresponsible. Corporate debt has risen to an all-time high of $9.1 trillion (nearly doubling) since the great recession of 2008 while cash-to-debt ratios have sunk to an all-time low. Not a good combination. And there are other concerns. Many companies borrowed billions in order to repurchase their own stock when the price of that stock was very near an all-time high and the economy was on the last leg of a weak economic expansion. The money didn’t go toward research or increased productivity or infrastructure upgrades, it went toward pushing their own stocks higher so they could cash out millions as they sold stock and stock options they had granted themselves as officers of the corporation. This is the kind of greedy unproductive debt that zero interest rates inspire. One more stop on the debt bubble tour; interest on the national debt was $371 billion for 2018, a shockling 20% increase from the prior year. The Peterson Foundation estimates that national debt interest payments will total nearly $7 trillion over the next decade, becoming the third largest “program” in the US budget. The Congressional Budget Office estimates that annual interest payments on the national debt could approach $1 trillion within the next decade. The Fed seems to have trapped itself, corporations, and consumers in a negative feedback loop of never ending indebtedness. Any kind of meaningful economic activity depends on the issuance of trillions of more debt. With interest rates barely above 2% the Fed seems to have little ammunition with which to fight the next recession. How can the Fed raise rates to historically normal levels without causing a debt crisis? No matter where you look we have piled debt up to the heavens with very little to show for it. Debt is the financial barometer of the soul. Debt never lies and always tells you how free or enslaved you are. The less debt you have, the greater the potential for freedom. Excessive debt squeezes the life out of you in ways that dollars can’t reflect. Debt will force its way into every conversation in the future. With such a powerful drag on businesses and consumers alike, economic activity and market gains could be very disappointing in the next seven to ten years.